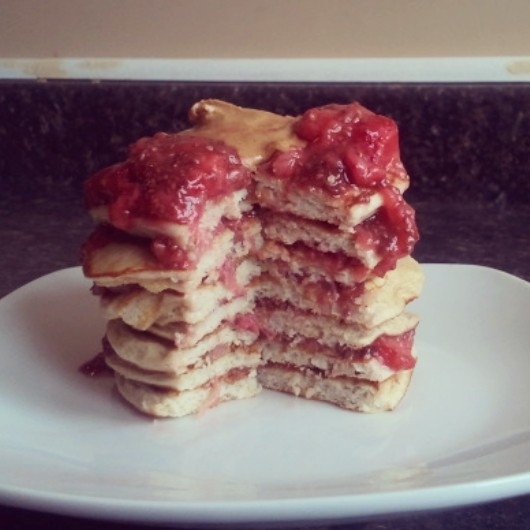 Quick and easy gluten free pancakes! 1. Defrost frozen strawberries and then mash them with the chia seeds. Let sit until the pancakes are finished. 2. Pre-heat a frying pan or a griddle to medium heat. 3. Place all ingredients except the peanut butter, strawberries, and chia seeds in a blender or a magic bullet. Blend until a uniform consistency is reached (usually takes 15-20 seconds). 4. Spray the pan with olive oil spray (can also use coconut oil). 5. Cook the pancakes for approximately 1.5 minutes per side (flip when the edges appear to be hardening and the bubbles on top have burst). 6. Layer pancakes with natural peanut butter and the strawberry-chia 'jelly'. Makes approximately 6-8 small pancakes. *I use vanilla whey powder but you could use any flavor you like.